This 18-day overland camping tour through South Africa begins in Johannesburg and travels along the Panorama route to the famous Kruger National Park where you search for Africa´s ‘Big Five’. You will explore Swaziland on foot and look for the black rhino in KwaZulu-Natal. 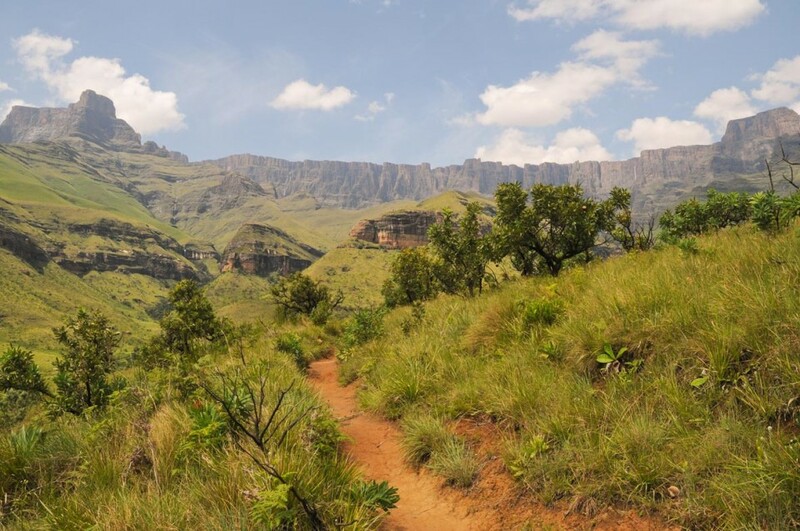 You hike the beautiful mountain paths in the spectacular Drakensberg mountains and explore the moutainous Lesotho which is 1400m above sea level. You will travel through the Great Karoo and go on game drives in the Addo Elephant Park before you travel along the Garden Route to see Table Mountain in Cape Town. Departing from Johannesburg you head east towards Mpumalanga, an area characterised by mountains, panoramic passes, valleys, rivers, waterfalls and forests. You will camp the night in the historical town of Pilgrims Rest - now a national museum - dating back to gold mining days in the 1870’s. You explore the quaint town, visit Bourke's Luck Potholes and the viewpoint at God’s Window. 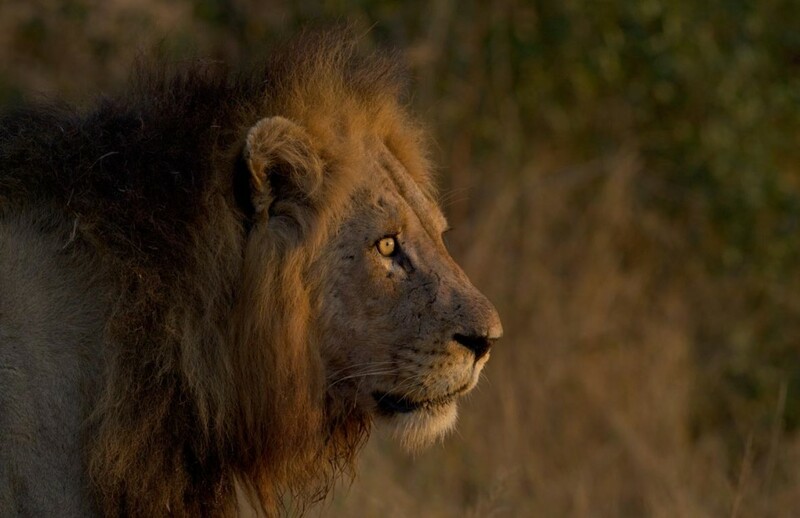 The Kruger National Park has the world's greatest concentration of species and 16 different ecosystems and, at almost 2 million ha, is the largest game reserve in South Africa. Game drives in high vehicle provide you with excellent opportunities for game viewing and photography. Spot the “Big Five” (lion, leopard, elephant, rhino and buffalo) and many other animals such as the graceful giraffe and cute but ugly warthogs. Malolotja Nature Reserve in the mountainous Kingdom of Swaziland is your next stop. The variety of habitats is home to species ranging from orchids and lilies to rare frogs, red hartebeest and leopard. Observe zebras grazing the grasslands, ancient cycads growing in the shade or climb out into the hills for fantastic mountain views. You explore the reserve on foot to enjoy the mountain scenery, rare birdlife, and the 95m high Malolotja waterfall. You overnight in log cabins with fantastic views over the landscape. The Swazi craft markets near Mbabane sells anything from baskets, clay pots and beadwork to second hand clothes and woodcarvings. You continue to Mkuze Game Reserve, a sanctuary for the endangered black rhino. You spend some time on a game drive, in a hide and watch game come to drink at the waterhole. Mkuze is a paradise for bird lovers and more than 420 species live here, including the fish eagle. 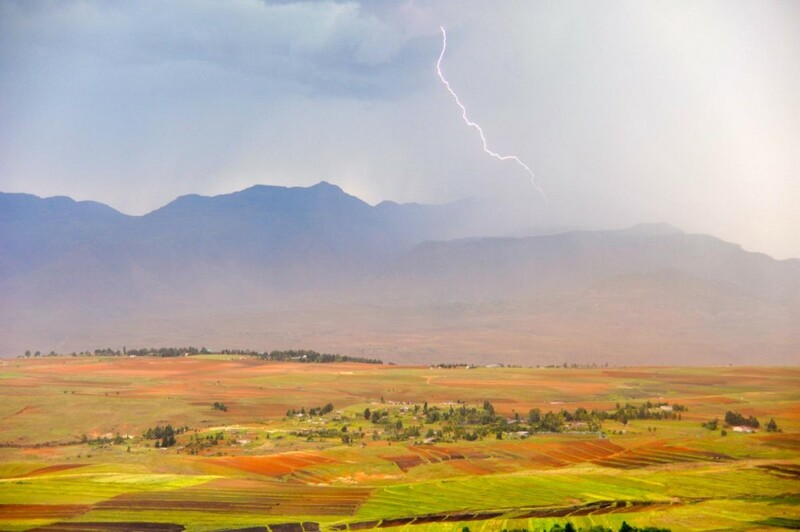 The Drakensberg Mountains or ‘the Barrier of Spears’ is a 200-kilometre-long mountain range and World Heritage Site with peaks of over 3 000m high. You overnight for two nights at the base of the mountains. You can hike along beautiful mountain paths, swim in an icy stream, breathe the fresh air and just enjoy the spectacular views. You travel through the towering red sandstone cliffs of Golden Gate en-route to Lesotho. Quaint villages and towns make interesting stops along the way. You cross the border and head to southern Lesotho and your overnight chalets at Malealea. This lodge nestled in the mountains is your base for two nights. The next morning you are up early and to go pony trekking with a local guide and his steed through the rough mountains. Descending from the Lesotho highlands you make your way into the flat plains of the arid great Karoo. This vast semi-desert is South Africa’s largest ecosystem and is a harsh and unforgiving landscape with the world’s largest assortment of succulents. It has become famous for its sheep and ostrich farming, quaint towns and its rugged beauty. The Addo Elephant National Park was established in 1931 to protect the last 11 wild elephants from extinction, successfully so, as more than 500 elephants now roam the area. The park offers of animals as diverse as black rhino, species of zebras and the Addo flightless dung beetle and over 400 bird species. 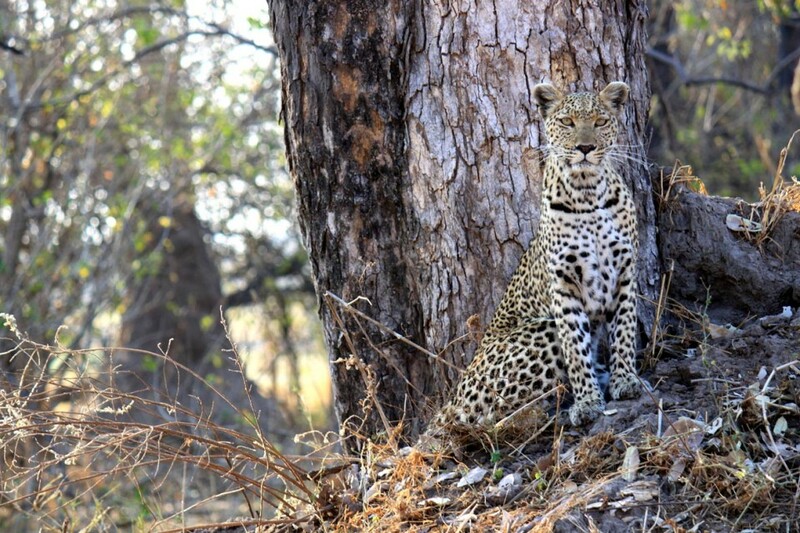 You head out on game drives in search of these inhabitants as well as to see, lion, buffalo and leopard. Evening viewing at the floodlit waterhole allows you to watch the animals’ nocturnal activities. Indigenous Tsitsikamma forests surround the campsite at Storms River mouth and there are walks in these forests, up the Storms River gorge and along the rocky coastline Walk the suspension bridge over the river mouth and explore the rock pools in the sea or dare to try the world’s highest bungee jump (optional activity, Whales may be seen in season (July to November) when they come to this coastline to breed. 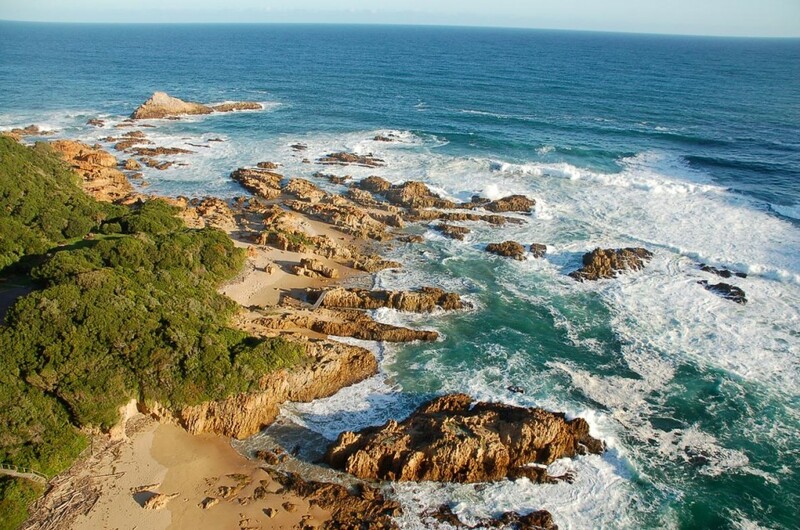 After visiting “The Heads” in Knysna, a town surrounded by a forest and tranquil lagoon you travel south along the Garden Route towards the famous wine regions of the Cape. You pass the Hottentots Holland Nature Reserve and Theewaterskloof dam before heading over the beautiful Franschhoek pass to your campsite near the quaint wine-making town of Franschhoek for the evening. You enjoy a morning walk in the vineyards then visit historical Stellenbosch for a cellar tour and wine tasting. 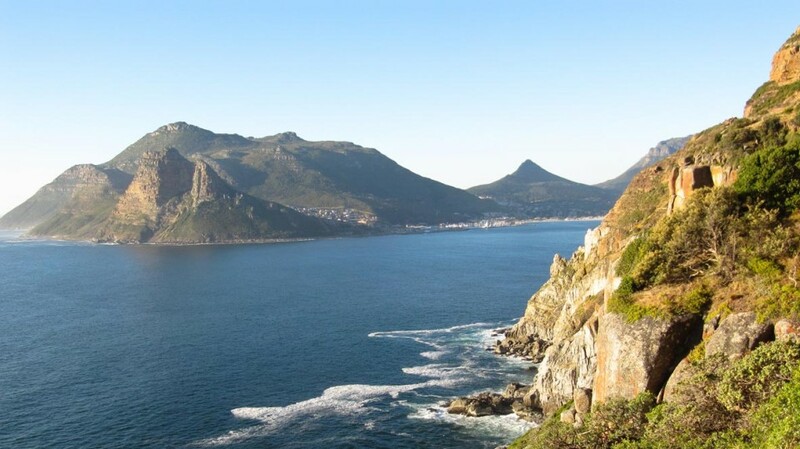 Explore Cape Town and the ‘Mother City’s’ many attractions; visit Cape Point, drive along Chapman’s Peak drive, the harbour at Hout Bay, enjoy the beaches and the V&A Waterfront. An optional visit to Robben Island (optional activity, not included in the rate) will depend on sea conditions. Enjoy the local fare – steak and seafood – at a restaurant of your choice, own account. You climb Table Mountain in the morning to enjoy the breath-taking views over the city, ocean and peninsula. Spend your last afternoon curio shopping or just lazing on the beach absorbing the Cape’s sunshine. - Group sizes vary however there is a minimum of 4 and a maximum of 12 travellers per group. Is there an age limit on tour? - Generally the age limit is 18 to 65 years. But if you are a youngster of 12 years and older travelling with your parents or if you are over the age of 65 years and can provide a doctors note confirming that you are fit enough to take part, you’re welcome on tour as well. Where does the group overnight while on tour? - 11 nights are spent in spacious 2-man dome tents (2,2 x 2,2m) on campsites with good ablution and other facilities. - 6 nights are spent in twin rooms / bungalows / chalets at nice guesthouses / lodges. What vehicle is used on tour? - We make use of safari trucks that have been reconstructed in order to cope with the demanding African conditions. Big windows guarantee first-class game and nature viewing and a spacious interior with comfortable seats offer a high travel comfort. The back part of the vehicle is used for luggage, food and camping equipment. What meals are included and what food can be expected on tour? - Breakfast usually consists of cereals, toast and jam. Light lunches like salads and sandwiches are prepared en-route while for dinner the guide prepares stews, BBQs, vegetables and different pasta or rice dishes. - We recommend that you take along some extra cash for drinks, snacks and souvenirs. 10-15 USD per day is usually sufficient (depending on your spending habits). In addition you should allow some extra money for the optional activities you might want to participate in. Do I need visa for this tour? 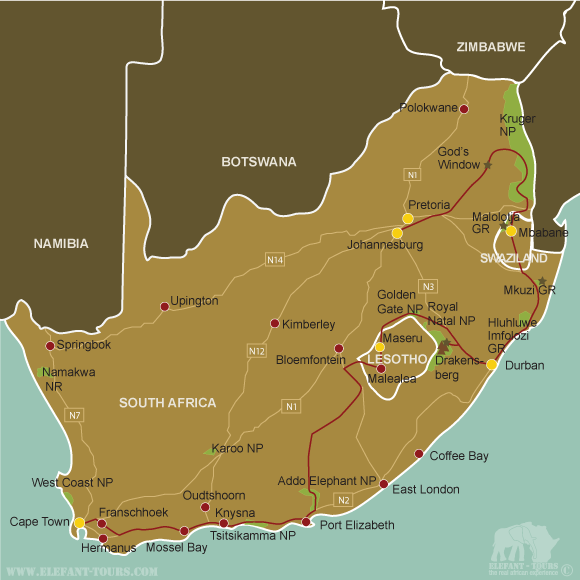 - In general European citizens do not require a visa for South Africa, Swaziland and Lesotho. Do I need vaccinations for this tour? - As the Kruger Park is situated within a malaria area, we would recommend some precautions. Please speak to your doctor or travel clinic about the different prophylaxis and their effects and side effects. - Although none of the countries visited on tour require proof of immunization against Tetanus, Diphtheria, Polio and Hepatitis A & B, we nevertheless recommend those vaccinations.